I hate to jump on this forum after just registering 4 days ago and no introduction. But I am pressed for time. Trying to ride from Chicago to Tucson during this nice weather opportunity. Flew from T. to C. to pick up an eBay purchased 1994 GL1500 Interstate with 42k miles. It has become a heartbreaking tale of treachery and malfeasance, but I need a quick tech question answered so I can hopefully get on the road during this lovely November weather. Background: Not a total noob on Wings. Owned a heavily modified '82 for 2 years, owned a Vetter faired '77 for 2-3 riding seasons. Been to Wing Dings, been riding mostly Hondas for 20+ years and 10+ bikes. Packed up and left this morning. New to me purchase, rode 120 miles and one tank of gas, no problems. Get on interstate this morning, 45 miles in, passing a truck, the engine starts stumbling. No backfire, just sputtering loss of power. With hope in my heart, I pull into a gs for a fill-up of premium and a bottle of Heet water remover. Dump in 1/2 of bottle. Sputtering begins again, 16 miles later. And again, 10 miles later after taking another exit- going through the gears, coming to a stop. Decide to head back to brother's house with a garage and tools. On the way back, I keep it at 60-65 and don't go over 3100 rpms. This seems ok. Throttle is not great, but it doesn't die on me. During the last tries it really was dying. Wide open throttle and RPMs and speed just dropping until I got surging at approx. 45 mph and had to pull over. All the trouble occurred when I was cruising at 70-75 at about 3500 RPM. Now, upon reaching home and surface roads it is running a little rough, and you need high RPM's to get first gear going. Different from before? I don't know because I thought I was just learning about clutch/power/rpms on new cycle. Last clue! After I parked it 2x in last week of new riding, there was the smell of fuel in the enclosed garage. No drips on floor. Also, last, last clue- now that I have burned two tanks, the mpg is bad. It went from F to 1/2 gauge in 70 miles. That ain't right? Again, cycle is old and new to me. Don't know if gauge is in perfect working order, or what cycle usually gets for mpg. I know I've got fuel system problems. The PO may have left it for at least a year. Do these symptoms ring a bell with anyone? It accelerates and operates around town, but sputters at sustained HWy speeds? The fuel consumption is high, smell of gas- is float bowl over filling? Where is the fuel going? Into intake manifold, and into cylinders? Too rich to run at 75 mph, but ok at 65 mph? New to me model Wing, I'm going to start learning about taking panels off and getting down to carbs and intake. Was hoping I might get some ideas from the Illuminati while I did my thing. Would really like to get started on trip during this good weather. Thanks for any help offered. 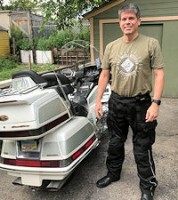 you have several help posts on www.goldwingfacts.com where you posted earlier. as before, give me a call and we can talk it out. Sounds a lot like what I was fighting with my wing. Had the similar sputtering, poor fuel economy, high revs to get going in first, and would idle but not die. Each time I touched the throttle it would struggle to stay alive. Turned out to be the fuel pump, it had enough flow to keep it idling but not enough when demand increased. I put a new pump in yesterday and its running better than it ever has since I've owned it. Hope this helps. But only at highway speeds? And why recover and then keep going around town? Right now (after a good cry and a nap) it is sitting and idling. Sounds like a diesel engine. "put-put-put". Turns over fine, revs pretty good. Not smooth. Before you look at the fuel pump, start somewhere cheaper: the fuel filter. If the fuel filter is clogged, it can limit the volume of fuel delivered to the carb float bowls. 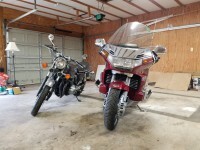 It can easily support what is required for lower power levels that are used at low speeds, but at highway speeds, it needs a lot more fuel, and with the restricted volume, the float bowls eventually empty out - and the bike literally runs out of gas. Once you slow down for a little bit, the fuel pump can get enough fuel into the bowls to refill them, and you're back to normal operation. If the fuel filter is replaced and you still see this behavior, then next I would do a fuel pump flow test - the procedure is in the service manual, and probably described here on the site somewhere. That makes sense, you are right. The float bowl is a reservoir, and it doesn't respond immediately to demand. Cycle could go many speeds/RPMs briefly without draining float bowl. Then, when I am at high demand, for longer miles, pump can't keep them full? I'm going to ride a little more tomorrow to reproduce symptoms. Trying to get to Tucson, and thinking, "Would it kill me to ride at 60-65 the whole way?" Not really, but the reason I turned around is that I'm afraid it will get worse and strand me in Texas. After looking at and or replacing the fuel filter and the symptoms persist, you might take a look at the vacuum operated fuel petcock. It is just inside the fuel fill door. That little sucker can cause similar issues as having a fuel filter that is clogged. It can be bypassed as a trouble shooting measure. As crazy as it might sound, when it starts sputtering, take the fuel cap off WHILE going down the road, it could be clogged up and restricting fuel flow at higher rpms too. . . . Mine did that, soaked over night in Seafoam and has not given any more issues. Of course, sorry, I forgot about that one!! That is a simple diagnosis - go out and ride with the fuel flap open. When you get to a point where the bike starts to sputter, reach down and loosen the fuel cap. If the bike comes back to life, you've found your culprit. This is a very common issue. One update- Got fuel filter out, full of rust debris and orange gas! Inspected airfilter, dirty but not infested with vermin. Plugged in universal filter, going to Honda shop to get two new filters. Idle still sounds bad. Any way to drain tank without removal? Is there a petcock at the bottom? Now, carbs needles and jets will be suspect until they come off and cleaned. There is no fuel drain. Siphon is your best option. Siphoned tank out. It has pretty good rust in the bottom. Got out a lot of debris with hand. Wiped inside down. Will address it more thoroughly at destination. Engine is still noisy. Exhaust sounds like diesel engine. Maybe unrelated? Didn't notice it before? Wing was not taken care of, so there could be more systems to look at. Sitting so long without maintenance- exhaust pipes could be full of carbon or rust? I'll pop them off and inspect, later. Have a head wind, traveling at 75 on all interstate roads. My mileage is only 28 mpg on 2 tanks. Love the Wing! Great for touring. Completely different than my VFR750. Thanks for all your help in getting on the road! Yup, I've experienced the same fuel sucking problem with high headwinds. Truthfully, I MUCH prefer a head wind to a cross wind. Crosswinds are nothing but torture. Run some Seafoam in every tank of gas. 8 ounces per tank comes to mind for amount to put in. I'm putting in treatment in every tank. This is a 2000 mi trip, so I will not get a chance to run so much chemicals through the engine when I get home. Not so many miles when you are getting groceries.